Fun and Games in Your Hot Tub | Austin TX - Paradise Spas & Outdoors Living | Hot Tub Store, Swim Spas, Patio Furniture, and More! Everyone who loves relaxation loves hot tubs. People who love fun also love hot tubs, because they are the perfect location for fun games. These games can be both R and G-rated, and today we’ll focus on the more family friendly fun. Part of the hot tub experience is sharing the fun with others, whether it’s family, friends or both. Cold Shower This game is a recommendation from The Great Backyard Place and is simple to play. All you need to do is fill a balloon with ice-cold water and pass it around after holding it for five seconds. Whoever has it pop on them loses, and to make it more fun, you can add stakes. For example, if the balloon pops on one of the kids, they have to do a chore. Lucky for you parents seeking free labor, this isn’t the only game where people can win or lose. Boat Races This is another game to which you can add stakes, but also one that encourages family bonding. You can use toy boats with and without a motor, and whoever gets from one end of the hot tub to the other wins. Plain and simple, but also fun. Some games are even simpler, for they do not need equipment. Questioning Games These are games such as Never Have I Ever, Two Truths and a Lie, and 20 Questions. Games like this can be played in and out of water, but let’s be real, everything is better in a spa. Games like this are great for getting to know each other and for when you don’t want to be too physical, as boat races demand splashing sometimes, and Cold Shower means hastily passing a balloon around the tub. You can modify questioning games however you’d like to fit your preferences. Other activities have inflexible, but still enjoyable rules. Splash Fights All you need is the water in the hot tub and the strength to push it at the people next to you. If that’s too easy, then add squirt guns to it. Usually there are no winners or losers, just players who are eager to roughhouse with one another. Any of these family games can be played with friends and party guests as well. These water-based activities will make for a great family game night or friends’ night in. Hot tubs may be a place for winding down, but with the right people they are a place to (appropriately) act up. If you are considering a hot tub for your home and live in the Austin TX area, visit Paradise Spas and Outdoor Living today! 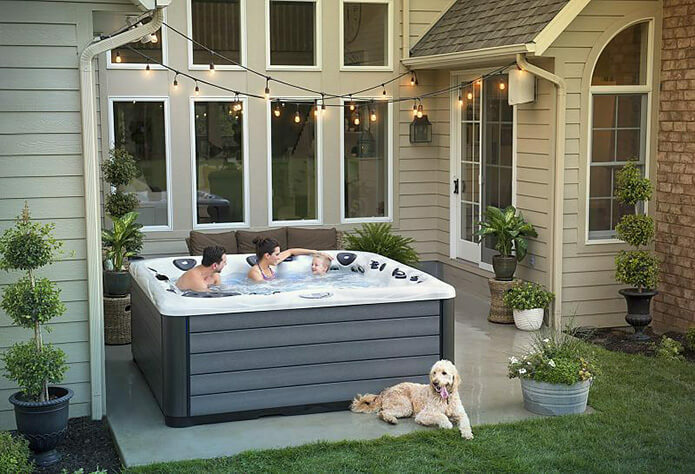 Whether you want a hot tub for relaxing fun, health or both, our trained and knowledgeable staff will help match your desires to the best performing hot tub for your home. Our hot tub retail store near Austin Texas, only carries the highest quality manufacturers and you are assured the best possible pricing in the Greater Cedar Park TX area. Contact or visit us today to learn more about our wide selection of luxury hot tubs and swim spas!